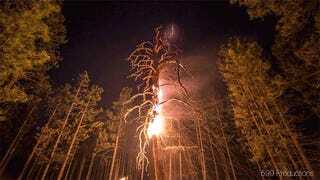 Before we all freak out, this was a controlled burn in the Kaibab Forest in northern Arizona and it was totally (mostly?) safe to film. Well, I sure hope it was. Either way, the individual trees that were on fire look spectacular against the starry night sky and the rest of the forest.